I had the opportunity last week to learn more about Leximancer, a text analytics company with its roots in Australia. Leximancer recently moved some of its operations to the U.S. and I had a very interesting conversation with CEO Neil Hartley about the company. Leximancer was founded in 2005. Its technology is based on seven years of research by Dr. Andrew Smith of the University of Queensland. The product employs a mainly statistical approach to text analytics. 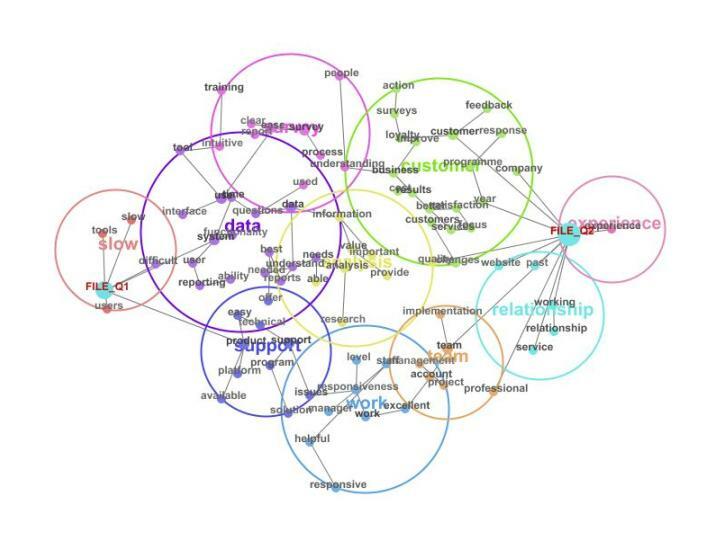 You simply feed the software unstructured text and the corpus is analyzed and a concept map is generated. These concept maps display main concepts, their relationship with other concepts, and emergent themes. This concept map displays some key themes associated with Q1 and Q2 survey responses (File Q1, File Q2). In Q1 (on the left), the major theme was “slow” and in Q2 the major theme was “experience”. These themes suggest that there was a problem with customer service in Q1. Other themes that are clustered around these themes provide more insight, as do the other concepts that make up the themes (e.g. slow and difficult associated with the slow theme) and the pathways between these concepts. For example, in Q1, the concepts such as slow, difficult, reporting, system, tools indicate that there may have been a problem with some of the company’s customer service. During Q2 the concepts better, quality, team appear to indicate that things are improving. However, it would be important to dive into the actual text associated with these concepts and pathways to determine if this is actually the case. Leximancer lets the user do this quite easily. The documents are submitted ->Stop words (e.g. a, the) are omitted ->A keyword count is performed –>The corpus is then broken up into segments and co-occurrence of words determined such that the resultant concepts represent a thesaurus of words that travel through the text together. Of course, some thought needs to go into the analysis that you want to perform so that you are feeding the system relevant information and getting useful concepts back. Neil was nice enough to provide me with an account to Leximancer’s Customer Insight Portal – a SaaS offering. The portal is very easy to use. You simply login and then tell the system the files you would like to analyze. You can upload internal documents or specify the URL(s) you would like to mine. Once the analysis is complete, you can then drill in and out of the concepts and highlight the pathways between concepts. I decided to explore the news about the financial crisis. 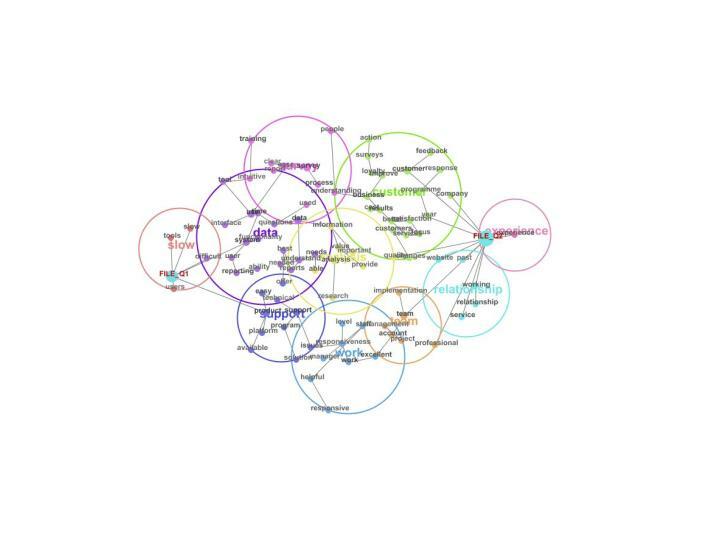 I input two popular financial websites into the insight portal and got out a concept map that looks like this. Note that this is a piece of the concept map. 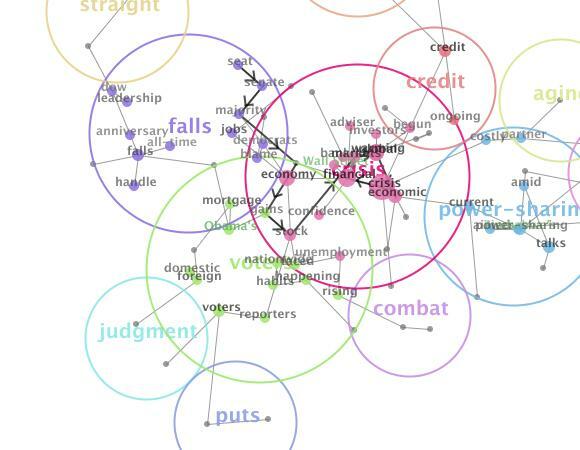 You can see various themes – crisis, voters, falls, credit and so on. Associated with each theme are a number of concepts. For example, the economic crisis theme has concepts such as confidence, stock, unemployment, banking, economy and so on associated with it. The falls theme has information associated with the Dow as well as concepts around jobs and seats. I was interested to understand the seats concept and its relationship to the economic crisis, so I highlighted the path. In a separate window (not shown here) all of the articles related to the concept path are highlighted. It then became obvious from the articles, that given the financial crisis, the democrats stand to gain more seats in the senate and lock up a 60 seat filibuster proof majority. Customer Insight allows businesses to aggregate customer feedback and analyze it in order to get to the root cause. This feedback can be from surveys, blogs, forums, and so on. Leximancer also offers the Lexbox – a feedback widget that companies can insert on their own websites to use as an additional source of information. Leximancer has about 200 customers, mostly in the educational and government space. Police departments, for example, are using the software to connect people and events as well as using it to perform social network profiling. Leximancer is also beginning to branch out to other verticals. It is looking to pursue a predominately OEM strategy, which is a good idea. Some of the vendors it will partner with will probably use the concept maps directly (depending who their audience is). Others will take the output from the maps and use it in another way. I plan to do some further analysis using the customer insight portal and will provide my additional feedback then.